This is an expanded web version, with additional content and images. Originally Published: 2013. Bird Observer 41(6): 352-363. 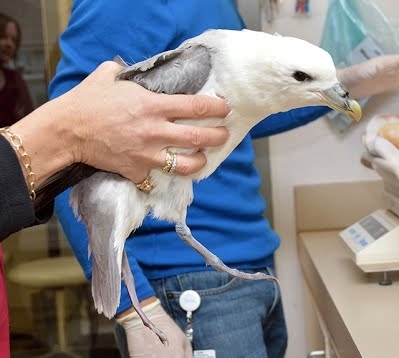 The the seventeenth report of the Massachusetts Avian Records Committee (hereafter MARC or the committee) covers the evaluation of 79 records involving 57 species or subspecies. Sixty-nine records were accepted, an acceptance rate of 87%. All accepted records in this report were accepted unanimously on the first round of voting unless noted otherwise. We present few details in this report. Much more narrative, evidence, and detail will be available on the MARC website: www.maavianrecords.com. We ultimately endeavor to have full accounts by species of every record we’ve treated. Don’t hold your breath—we’ve been working on that for a while! But we are making progress, and shorter annual reports enable us to focus our attention on the website and on dealing with the rich trove of historical records. Our long-term goal is to consistently provide robust and current information on each of Massachusetts’s rarity records. To this end, the committee has taken a small but relatively dramatic step to address a widespread “problem”: how can volunteer records committees keep up with the pace of current records, not to mention make headway treating historic ones, when records of rare birds are increasing? MARC considered the increase in records (which we attribute in part to our policy of proactively seeking records to review), the stellar photos that accompany most records, and the recent rise of eBird and its sound structure for expeditious reviewing of records. The committee agreed that certain records will be presumed accepted by MARC once they are accepted in eBird—which means the regional eBird reviewer has accepted them—so long as such records are accompanied by a photograph. The committee will maintain a list of species that are particularly rare or difficult to identify. Records of these species and sight-only submissions will continue to go through the traditional review. With that bit of committee arcana behind us, let’s focus on the records reviewed this past year. Two new species have been added to the State List. One was a doozy—a Gray-tailed Tattler (Tringa brevipes) that Jeremiah Trimble and Simon Perkins found on October 18, 2012, just in time for the Nantucket Birding Festival. The discovery was dramatic. The bird was first located by call and then identified as a tattler as it flew away in the evening, with fears it would not reappear. Peter Trimble, Jeremiah’s dad, finally documented the bird photographically the next day a good five miles away at Sesachacha Pond. 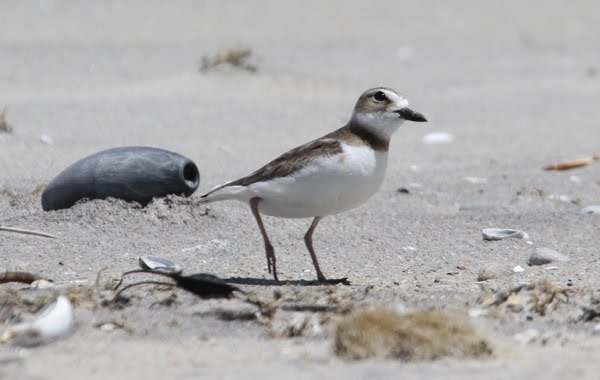 While a good number of festival participants and quick-on-the draw chasers were able to catch up with this mind-numbingly unexpected “Sibe” shorebird the following day, it was not refound after the noon high tide on its third day. Hordes of twitchers arriving Sunday went home disappointed. Amazingly, a more obliging Wood Sandpiper (Tringa glareola) in Rhode Island arrived the previous weekend and stayed through these dates, so was a nice consolation prize for some. 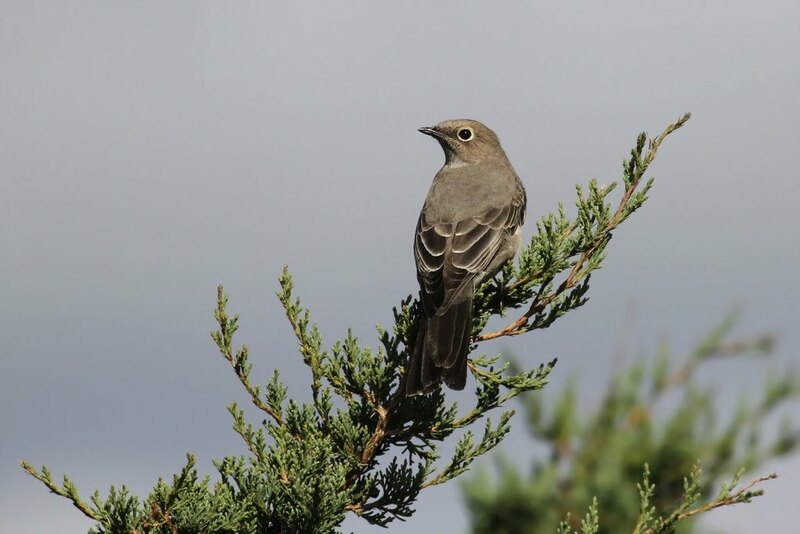 With Gray-tailed, Massachusetts now has two tattlers on the State List, which is two more than any other state on the East Coast! 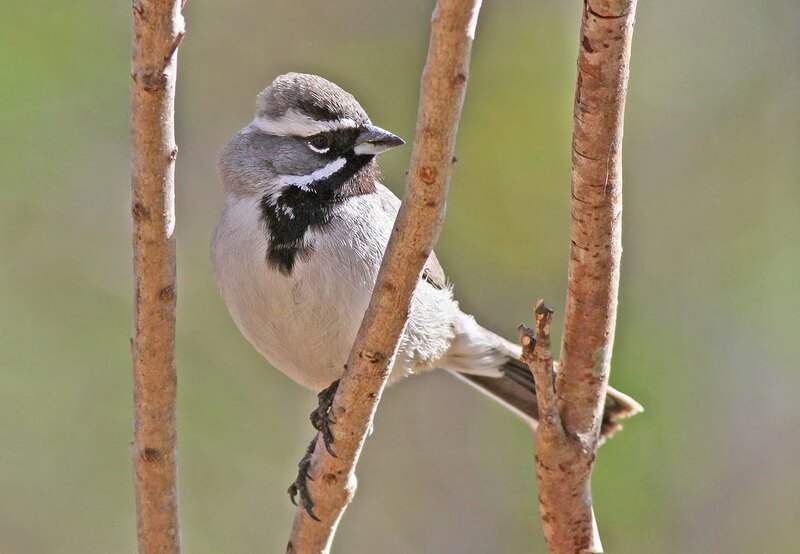 The second species to become a first state record was unfortunately not chaseable, a Black-throated Sparrow (Amphispiza bilineata) that was a two-day wonder at a private yard in Brewster. Fortunately, stellar photographs were obtained to document this first accepted record. Reports from Deerfield on November 4,1959, and from Amherst on April 12,1963, may well have been correct but lacked convincing details and were not accepted by MARC (Petersen 1995). The latter individual occurred during an apparent incursion of the species to the eastern United States (Veit and Petersen 1993). An additional interesting record was the Eurasian Blackbird (Turdus merula) that was discussed by Wright (1909). The account of the bird overwintering at the Boston Public Garden convinced the committee that the identification was correct, but the committee concurred with Wright that this was most likely an escapee. 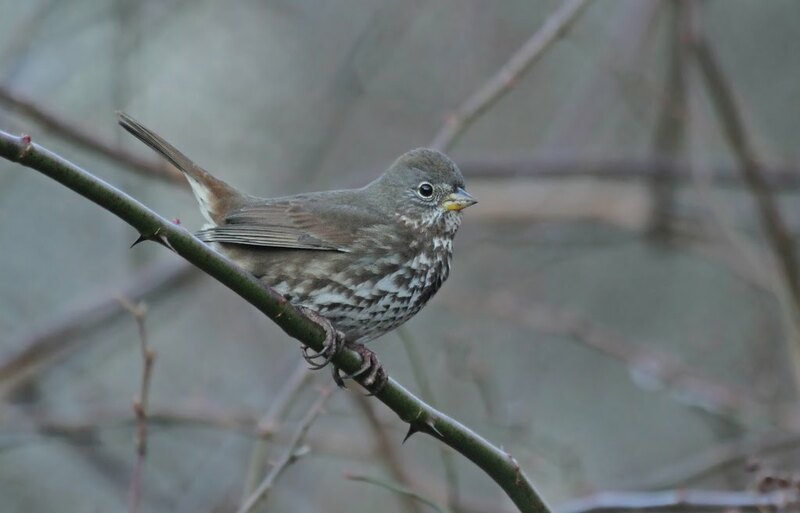 Nonetheless, this European thrush is migratory and has reached Quebec and Newfoundland, with the latter bird accepted as being of natural provenance. 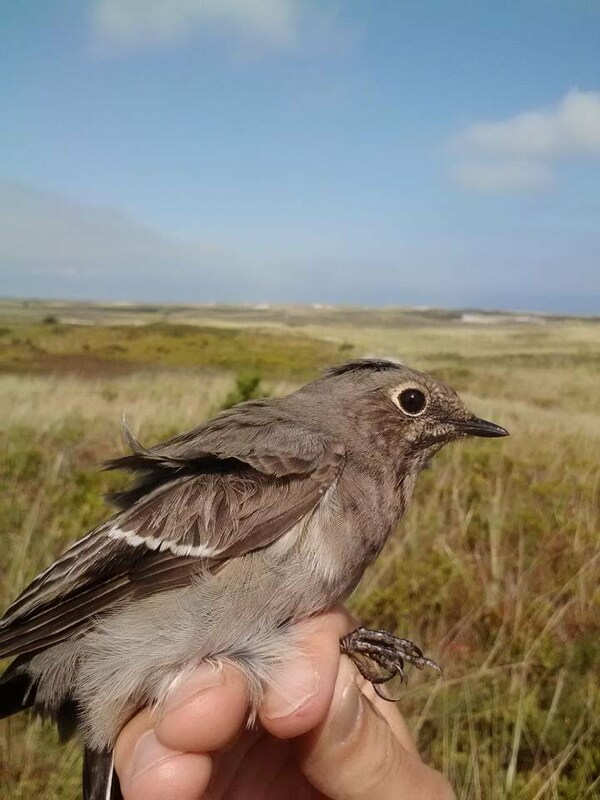 Also notable in this report was the acceptance of two records of Sooty Fox Sparrow (Passerella iliaca [unalaschensis group]), both from Cape Cod. Greg Hirth and Fred Atwood found the first in 2010; John Young found the other in 2012. This subspecies may one day gain full species status and is a taxon heretofore unrecorded in Massachusetts, with only two prior records reported on the East Coast. 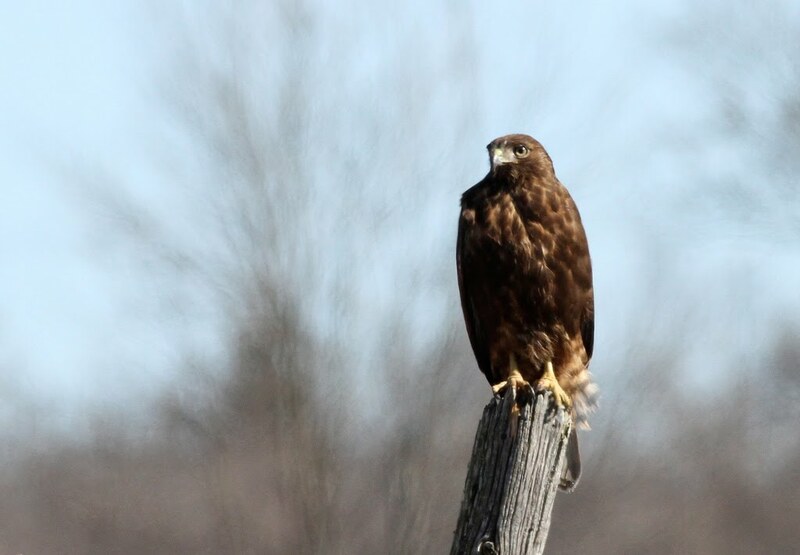 A similar “new taxon” was Massachusetts’s first Western Red-tailed Hawk (Buteo jamaicensis calurus), a dark morph found in Hadley by keen Hampshire student Jacob Drucker. Additional, twitchable headline-grabbers were the second state record of Fieldfare (Turdus pilaris) and third state record of Lazuli Bunting (Passerina amoena). This report also includes a deletion from the State List. Jim Berry and Wayne Petersen unearthed Ludlow Griscom’s field notes for Massachusetts’s two records of White-tailed Eagle: one from the Merrimack River in the winter of 1935 and the other from the Merrimack nine winters later. (See Rines 2009 for MARC’s rejection of a third record.) The views were distant and notes were brief, failing to rule out an immature Bald Eagle (Haliaeetus leucocephalus), and Griscom himself expressed the view that more support should be needed for such an incredible record (Griscom and Snyder 1955). The committee agreed not to accept the two records. With the gain of Gray-tailed Tattler and Black-throated Sparrow and the loss of White-tailed Eagle, the State List only moves up a single notch to 499, perching just below an historic milestone. East of the Mississippi River, only Florida has an official state list above 500. The White-tailed Eagle records did present an important reminder on the importance of keeping and archiving records. Thankfully, the Griscom notes allowed evaluation of the original merits of the record decades after the original sightings. The committee strives to provide future researchers and ornithologists­—who will need to make their own determinations on what occurred where—with access to the primary evidence used to support each record. MARC’s role is not simply to stamp something accepted or not; its more important function is to preserve the evidence so that sound decisions can be made based on evolving knowledge and standards. The 2012–13 roster of MARC voting members was Marshall J. Iliff (chair), Ian Davies, Trevor Lloyd-Evans, Mark Faherty, Blair Nikula, Wayne R. Petersen, Scott Surner, Jeremiah R. Trimble, and Richard R. Veit. Veit has since resigned from the committee and has been replaced by Tim Spahr, who has hit the ground running as one of the primary authors of our new species accounts. Matt Garvey continues as secretary and Ryan Doherty continues as Webmaster. In this truncated report, for each record of each species or taxon covered, we present basic statistics: the record number and where, when, and who submitted evidence. We also indicate whether the evidence provided was photographic (ph. ), video (v.), audio (au. ), or a written submission (†). As always, the committee strongly encourages written submissions even where photographs exist. When known, we try to credit the discoverer with an asterisk (*), especially if he or she has supplied evidence. The statistics in brackets for each species or taxon show the number of MARC-accepted records in this report, followed by the total number of MARC-accepted records for that species, followed by our estimate of total known records, often supplemented with a plus sign (+) where we know there are additional records but are not sure how many. We do not count or use a plus sign for 2011–2013 records that are currently in review. For a subspecies, the statistics refer to the species unless noted otherwise. Species not on the Review List do not receive a count. Species taxonomy and nomenclature follow the seventh edition of the American Ornithologists’ Union (AOU) Check-list of North American Birds (AOU 1998) and supplements (Chesser et al. 2009, Chesser et al. 2010, Chesser et al. 2011, Chesser et al. 2012, Chesser et al. 2013). Subspecies nomenclature follows taxonomy of The Clements Checklist of Birds of the World (Version 6.8), available at http://www.birds.cornell.edu/clementschecklist. The list of species reviewed by the MARC (the Review List) is available at www.maavianrecords.com. Since well-documented records of Bicknell’s Thrush (Catharus bicknelli) are so rare (easily fewer than one every two years), the committee voted to add it to the review list. Common Shelduck (Tadorna tadorna) was also added to the supplemental list, based on the 2009 record (Garvey and Iliff 2011) that narrowly missed full acceptance. Please check out the full Review List and send us any evidence of new or old records you may have. We are particularly interested in records of the three species for which the committee has no physical supporting evidence: Western Meadowlark (Sturnella neglecta), Brown Noddy (Anous stolidus), and Painted Redstart (Myioborus pictus). The MARC website has much more information, including the MARC bylaws, past annual reports, and the State List. We are slowly but surely adding species accounts for all species on the Review List. 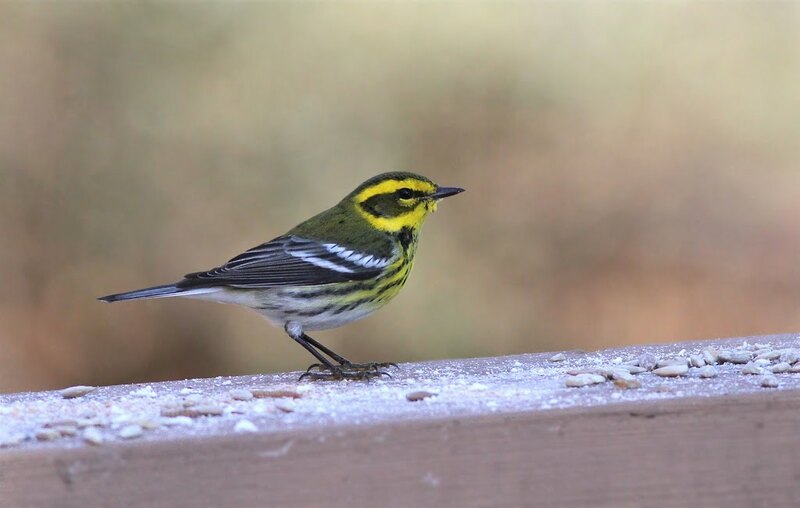 We hope that birders in Massachusetts and beyond will use the list to help them understand the status and occurrence patterns of rarities in Massachusetts, which is what we’re all about. Please help us by sending us your evidence of rare birds, whether you saw the bird today or years ago. Photos and notes in an attic or a personal journal are great, but please get a copy to us so we can share it with fellow enthusiasts in an organized, comprehensive, and easy-to-find manner. 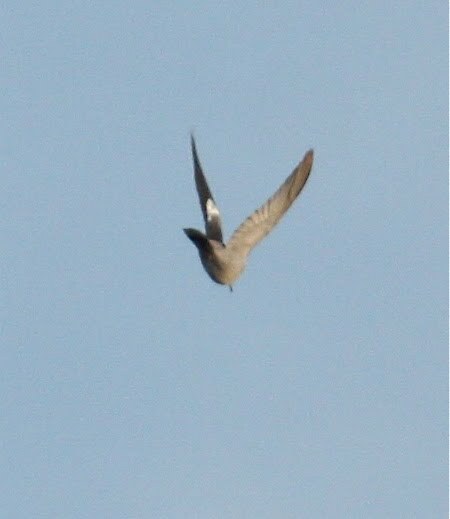 2012-135: 1 at North Pool, PRNWR, Plum Island, Essex, 8/4/2012 [ph. Brian Harris*]. Second record for Essex County. 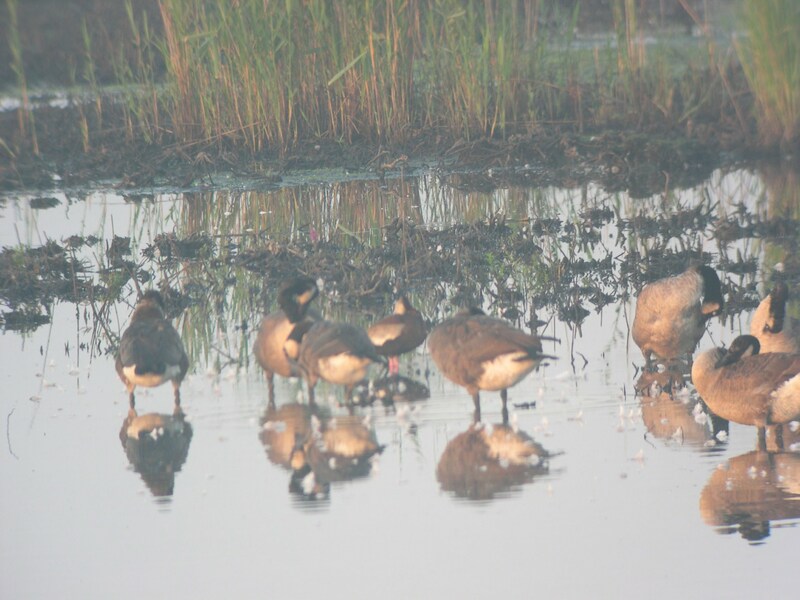 Black-bellied Whistling-Duck among Canada Geese in the fog. Parker River NWR, 4 Aug 2012. Photo by B. Harris. 2012-63: 2 at Fenway War Memorials, Boston, Suffolk, 7/22/2012 [ph. A. Baker*]. First record for Suffolk County. Loafing Black-bellied Whistling-Ducks, a long toss away from Fenway Park, 22 Jul 2012. Photo by A. Baker. 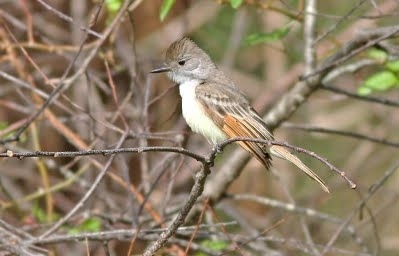 2012-64: 1 adult at Great Meadows NWR­—Concord Unit, Middlesex, 7/3/2012 to 9/1/2012 [ph. R. Doherty*, ph. J. Forbes, ph. R. Schain]. Second record for Middlesex County. 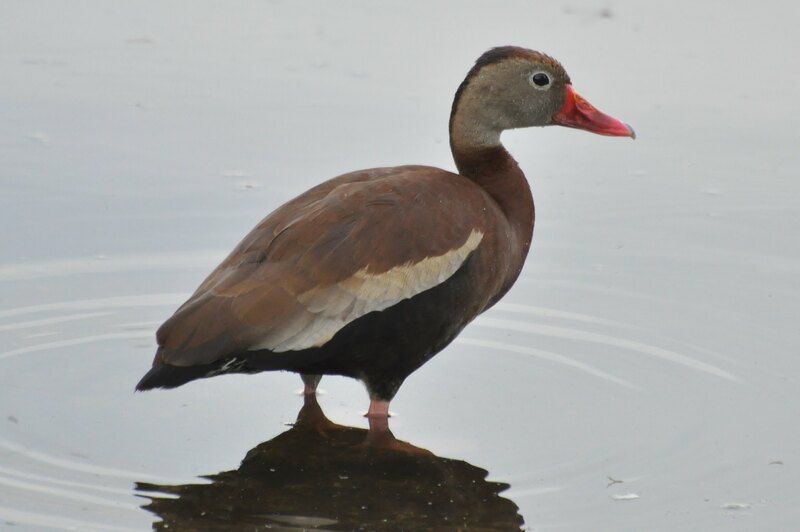 Nice portrait of a Black-bellied Whistling Duck. Great Meadows NWR, 3 Jul 2012. Photo by R. Doherty. 2011-48: 1 adult at Bear Creek Sanctuary and Barry Park, Saugus, to Hood Playground, Lynn, Essex, 12/11/2011 to 12/14/2011 [ph. M. Iliff, ph. J. Offermann, P. Peterson*, ph. R. Schain]. First record for Essex County. 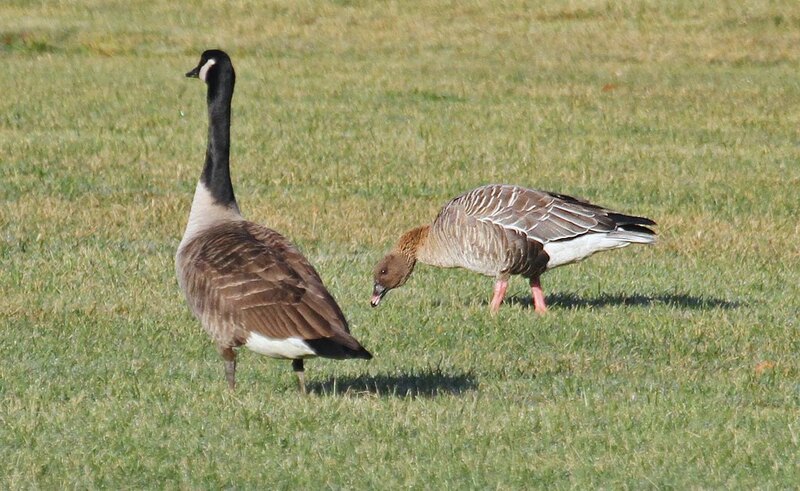 Pink-footed Goose with cousin. Saugus, 13 Dec 2011. Photo by R. Schain.2011-49: 1 adult at Rutland, Worcester, 12/17/2011 to 12/18/2011 [ph. †K. Bourinot*, ph. Mark Lynch]. First record for Worcester County. 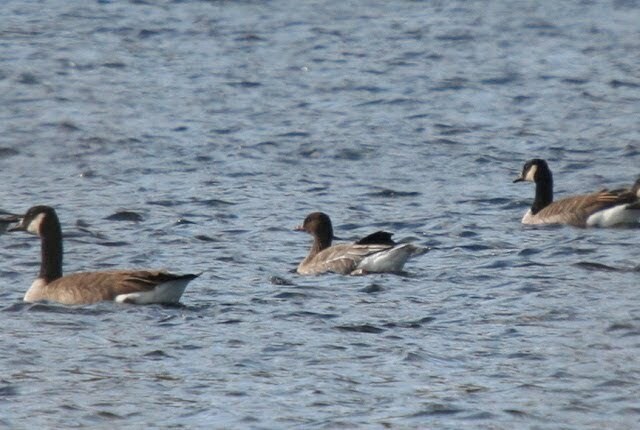 Pink-footed Goose in Worcester County. 17 Dec 2012, Rutland. Photo by K. Bourinot.2012-83: 1 adult at Artichoke Reservoir, West Newbury, Essex, 10/20/12 [ph. G. Gove*]. Second record for Essex County. 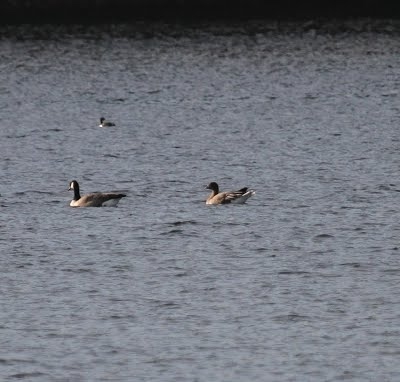 Pink-footed and Canada Goose, West Newbury, 20 Oct 2012. Photo by G. Gove. 2011-50: 1 adult at Rogers Street to Upper Artichoke Reservoir, West Newbury, Essex, 11/6/11 to 1/3/12 [ph. P. Brown*, ph. R. Schain]. 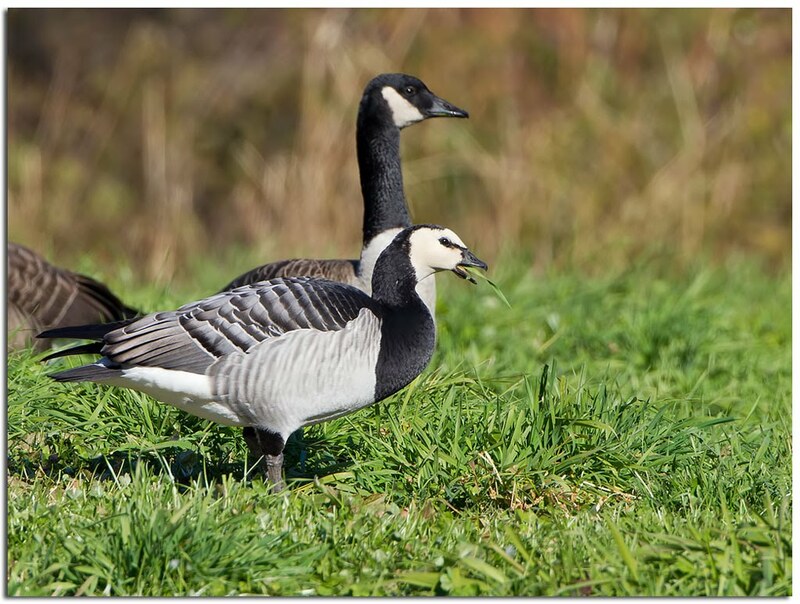 Barnacle Goose, photo by P. Brown. West Newbury, 6 Nov 2011. 2011-51: 1 adult male at Manchester Reservoir and Lake Hiawatha/Falls Pond, Attleboro and North Attleboro, Bristol, 10/22/2011 to 2/29/2012 [ph. S. Glynn, J. Sweeney*, ph. R. Schain, ph. J. Trimble]. Drake Tufted Duck with Scaup, Attleboro, 10 Feb 2012. Photo by J. Facteau. 2012-073: 1 at mouth of Merrimack River, Salisbury, and Newburyport, Essex, 3/4/2012 to 3/17/2012 [ph. †E. Labato*, ph. R. Schain]; accepted on second ballot (8-0). 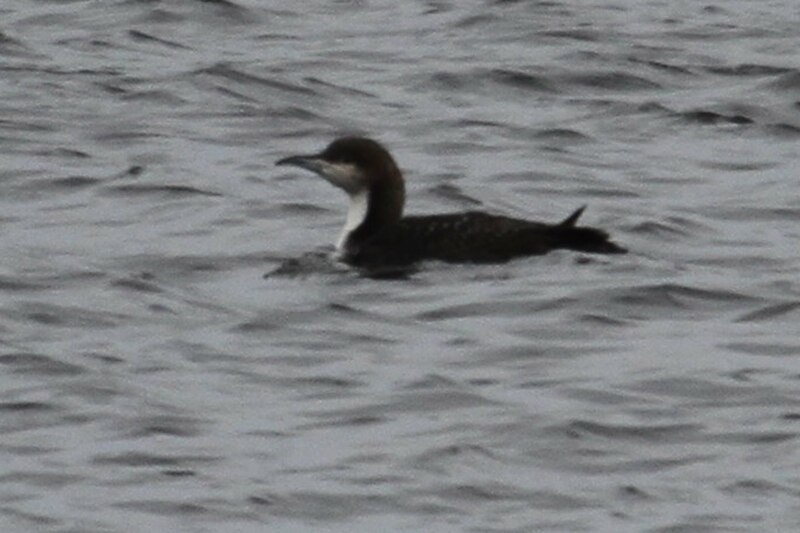 Pacific Loon, showing slightly deformed bill. Salisbury, MA, 4 Mar 2013. Photo by E. Labato.2013-04: 1 at Race Point, Provincetown, Barnstable, 1/13/2013 [†E. Neilsen*]. 2012-113: 1 at Pochet Island, Orleans, Barnstable, 11/11/2012 [ph. C. Goodrich*]; accepted on second ballot (8-0). Western Grebe, Orleans. 11 Nov 2012. Photo by C. Goodrich. 2012-84: 1 ad. off Martha’s Vineyard (40 52.8092° N, 70 43.0115° W), Dukes, 12/2/2012 [ph. B. Gervalis*]. Photos clearly show it to be the expected subspecies: T. m. melanophris. First photo-documented record for Massachusetts and first record for Dukes County. 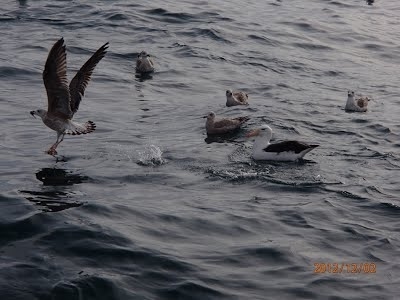 Black-browed Albatross dwarfing the competition, 2 Dec 2012, off Martha’s Vineyard. Photo by B. Gervalis. 2012-132: 1 picked up alive at Springfield, Hampden, 12/13/2012 [ph. unknown]. Third inland record (see Veit and Petersen 1993) and new for Hampden County. 2006-63: 1 at Hydrographer Canyon, approximately 80 miles southeast of Nantucket, 7/6/2006 [†Tom Auer*]. Rejected as Black-capped on a third-round vote, (2-6), but accepted (7-1) as Black-capped Petrel/Bermuda Petrel. 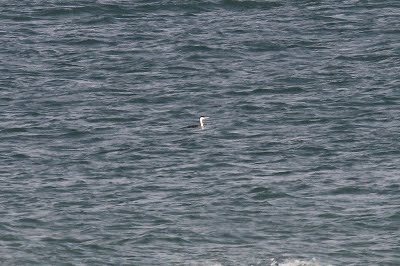 2012-62: 1 of the ‘white-faced’ form off Nantucket, 39.998322° N, 70.770526° W, Dukes, 7/21/2012 [ph. J. P. Smith, ph. J. Trimble]. 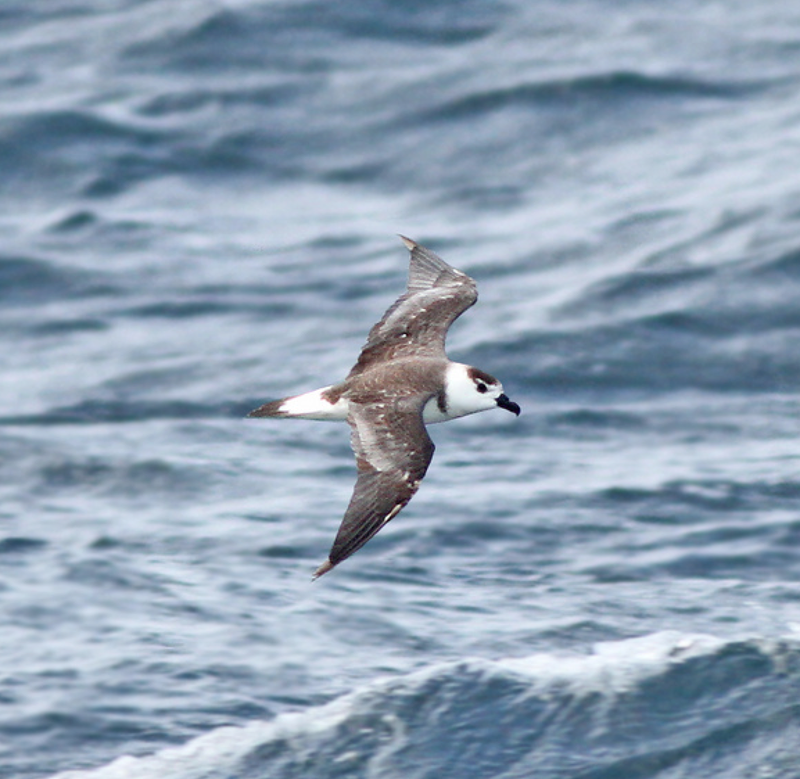 Black-capped Petrel, 21 Jul 2012, somewhere south of Nantucket. Photo by J. Trimble. 2012-87: 1 at Andrew’s Point, Rockport, Essex, 12/21/2012 [† R. Heil*]. 2012-107: 1 adult about 60 miles east of Nantucket, 6/13/2012, [H. Goyert*, † T. Johnson]. 2012-131: 1 subadult, initially 40.3805° N, 70.7995° W, sallied forth and returned to ship periodically to Martha’s Vineyard Sound, Dukes, 7/26/2012 to 7/28/2012 [ph. † M. Schrimpf *]. First for Dukes County. Brown Booby enjoying a sailing excursion. Photo by M. Schrimpf 26 July 2012. Near Martha’s Vineyard. 2011-54: 1 at Morris Island Causeway, Barnstable, 10/28/2011 [M. Faherty*, ph. † R. Schain, ph. P. Trimble]. American White Pelican, Chatham, 28 Oct 2011. Photo by R. Schain. 2011-55: 1 at Cuttyhunk Harbor, Gosnold, Dukes, 8/30/2011 to 9/12/2011 [ph. E. Hierta, † B. Slade, ph. B. Weir]. 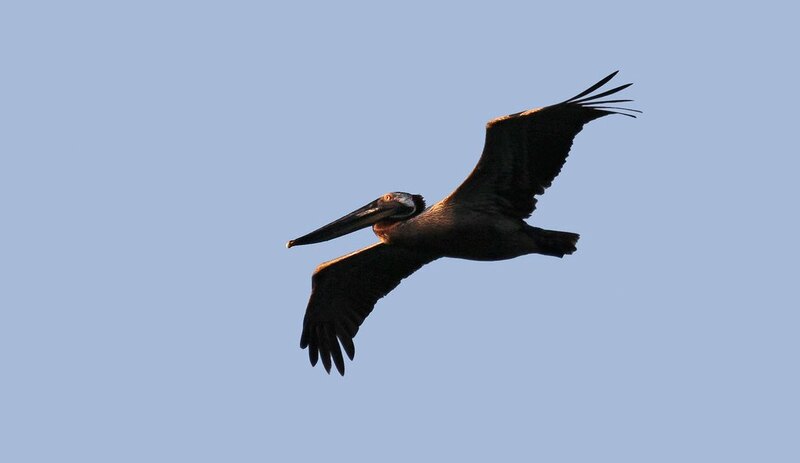 Brown Pelican at liftoff. Photo by B. Weir, 2 Sep 2011, at Cuttyhunk. 2012-66: 1 at Lobster Cove, Annisquam, to Gloucester Harbor, Gloucester, Essex, 6/5/2012, [ph. † J. Barber*, ph. R. Stymeist]. 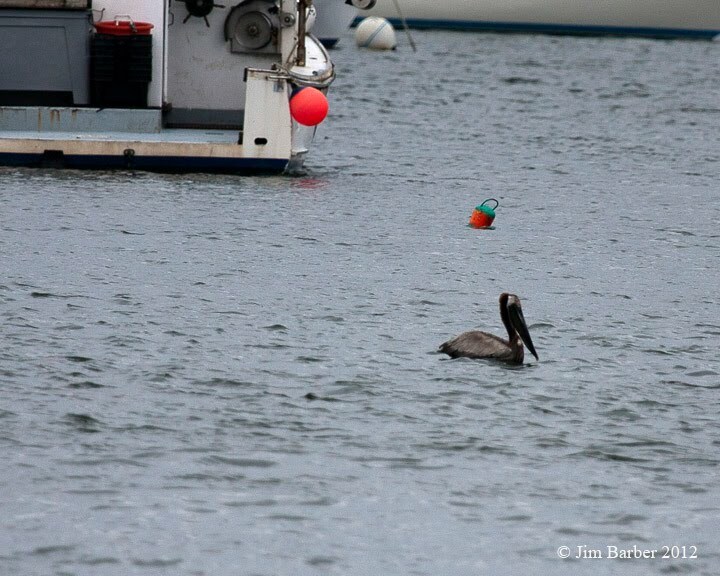 Brown Pelican among boats and buoys in Gloucester Harbor, 5 Jun 2012. Photo J. Barber.2012-67: 1 at Black Falcon Pier to Spectacle Island, Boston Harbor, Suffolk, 6/9/2012 to 6/30/2012 [ph. B. Mackey, ph. R. Schain]. Brown Pelican, 10 Jun 2012, Boston. Photo by R. Schain. 2012-102: 1 juvenile at Morris Island Causeway, Chatham, Barnstable, 8/29/2012 [ph. D. Manchester*]. White Ibis in flight, 29 Aug 2012. Photo by D. Manchester, Chatham. 2012-61: 2 adults at Kettle Island, Manchester, Essex, 5/19/2012 to 5/27/2012 [ph. J. Offermann, ph. S. Perkins, ph. † R. Schain*, ph. J. Trimble]. 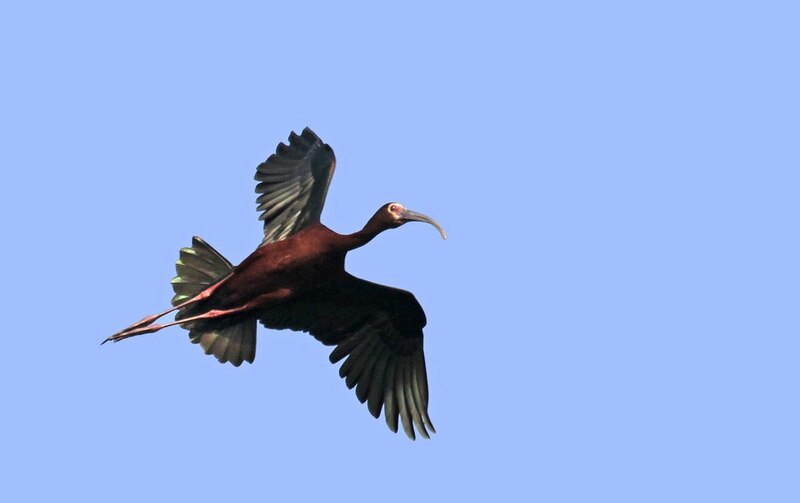 White-faced Ibis, coming in for landing. Manchester, 27 May 2012. Photo by R. Schain. 2012-74: 1 at Nantucket, 5/31/2012 [S. Ainsworth*, K. Griswold, ph. V. Laux]. 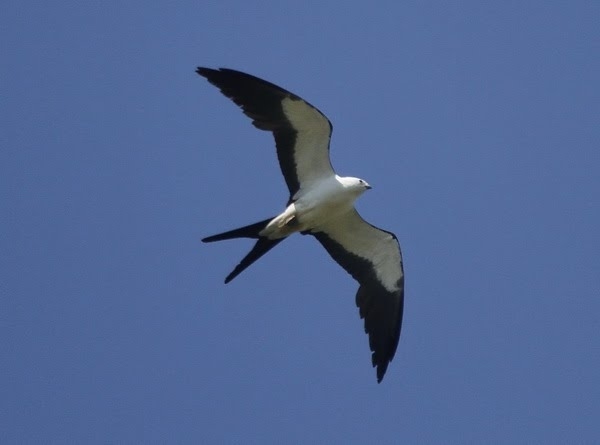 Swallow-tailed Kite from Nantucket, 31 May 2012. Photo by V. Laux. 2012-04: 1 immature dark morph at Hampshire College Farm and South Maple St., Hadley, Hampshire, 2/17/2012 to 3/12/2012 [ph. I. Davies, † J. Drucker*, ph. R. Schain, ph. L. Therrien]; accepted on second round (8-0). First state record of subspecies calurus. Red-tailed Hawk, ‘western’ form. Hadley, 26 Feb 2012. Photo by I. Davies. 2012-75: 1 female at private beach on south side of Martha’s Vineyard, Dukes, 5/18/2012 to 5/19/2012 [L. Johnson*, ph. L. McDowell]. 2012-116: 1 at Nantucket Harbor Creeks and Quaise Marsh, UMass Field Station, Nantucket, 10/18/2012 to 10/20/2012 [ph. au. T. Johnson, † S. Perkins, ph. au. v. † J. Trimble*, ph. P. Trimble]. First record for Massachusetts and first record for Lower 48 states away from immediate Pacific coast. 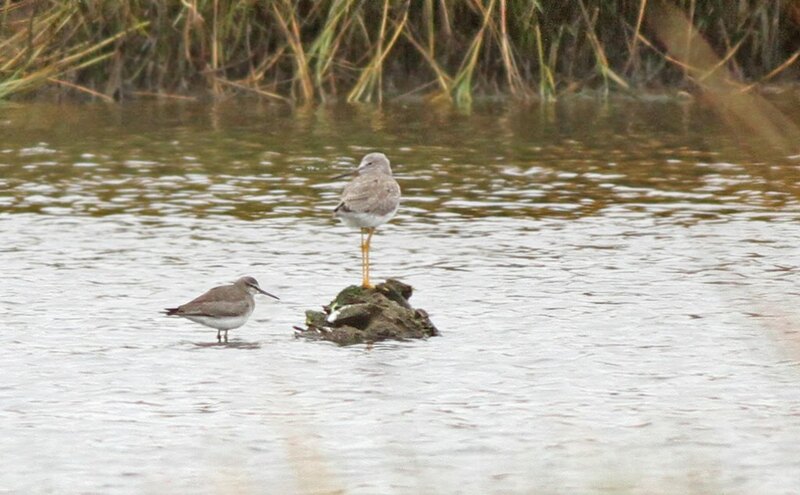 Gray-tailed Tattler and Greater Yellowlegs at Nantucket on 19 Oct 2012. Photo by J. Trimble. 2012-71: 1 first-summer at Tuckernuck Island, Nantucket, 6/7/2012 to 6/9/2012 [ph. D. Veit*]. 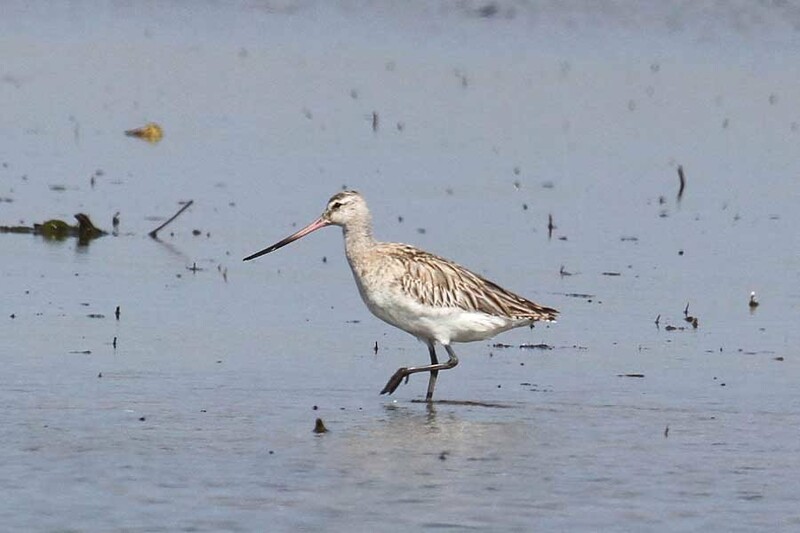 Bar-tailed Godwit, 9 Jun 2012. Tuckernuck. Photo by S. Perkins.2012-72: 1 first-summer at South Beach, Chatham, Barnstable, 6/21/2012 to 9/15/2012 [ph. B. Nikula*, ph. R. Schain]. 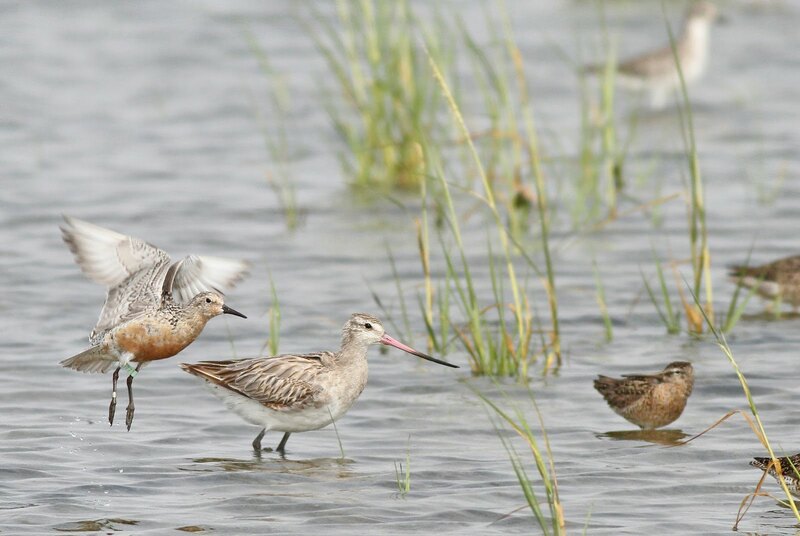 Bar-tailed Godwit and friends. 4 Aug 2012, Chatham. Photo by J. Trimble. 2012-81: 1 adult at South Beach, Chatham, Barnstable, 7/21/2012 to 7/22/2012 [ph. M. Iliff, ph. † B. Nikula*]. 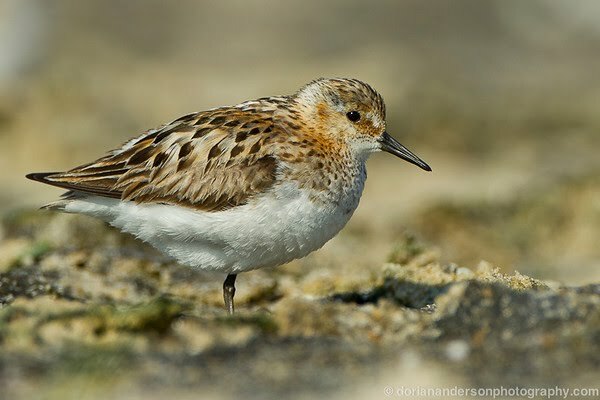 Adult Little Stint. 22 Jul 2012. Chatham, photo by M. Iliff.2012-82: 1 adult at South Beach, Chatham, Barnstable, 9/2/2012 to 9/8/2012 [ph. D. Anderson, v. M. Garvey, ph. B. Nikula*, ph. J. Trimble]. 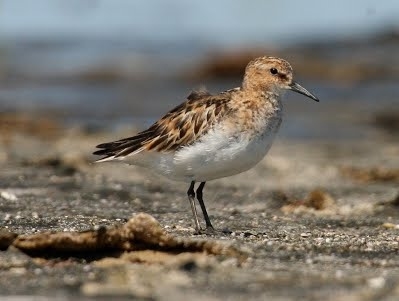 Another adult Little Stint. 9 Sep 2012. Photo by D. Anderson. Chatham. 2012-60: 1 adult at Tern Island/South Beach, Chatham, Barnstable, 8/24/2012 to 9/3/2012 [ph. D. Anderson, ph. E. Orcutt*, ph. R. Schain]. 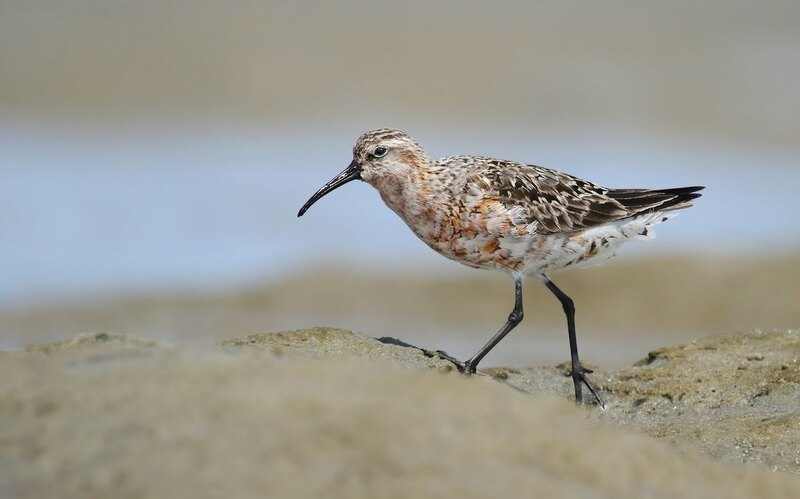 Curlew Sandpiper, molting adult. 25 Aug 2012, South Beach, Chatham. Photo by R. Schain. 2011-97: 1 at Herring River Conservation Area, Bells Neck Road, West Harwich, Barnstable, 12/31/2011 (or earlier) to 3/6/2012 [ph. R. Heil, ph. B. Nikula*]. 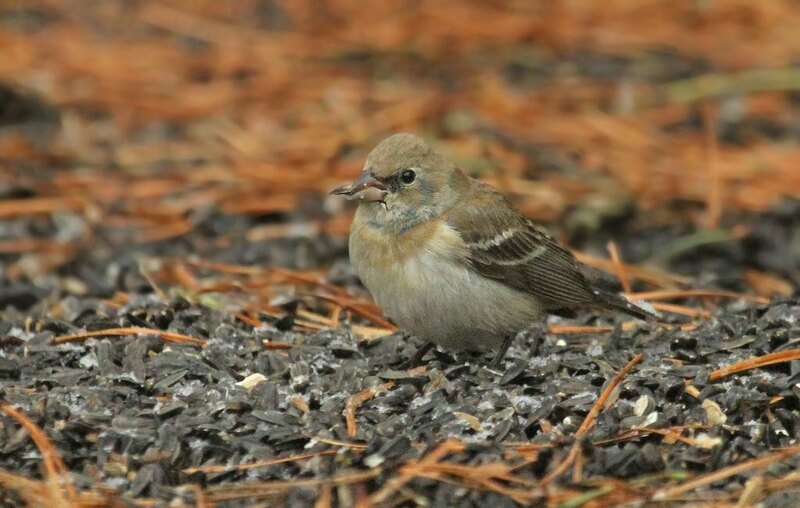 First overwintering record for Massachusetts. 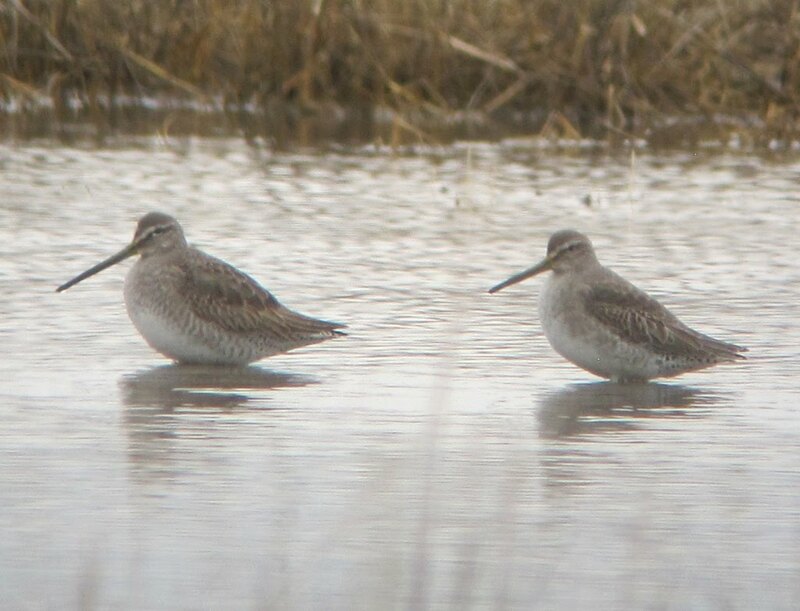 Great comparison shot of Long-billed (left) and Short-billed Dowitchers. Photo by R. Heil on 2 Feb 2012 in Harwich. 2012-59: 1 adult at Indian Neck, Wellfleet Harbor, Barnstable, 1/22/2012 [ph. M. Iliff, ph. B. Nikula*, ph. J. Trimble]. 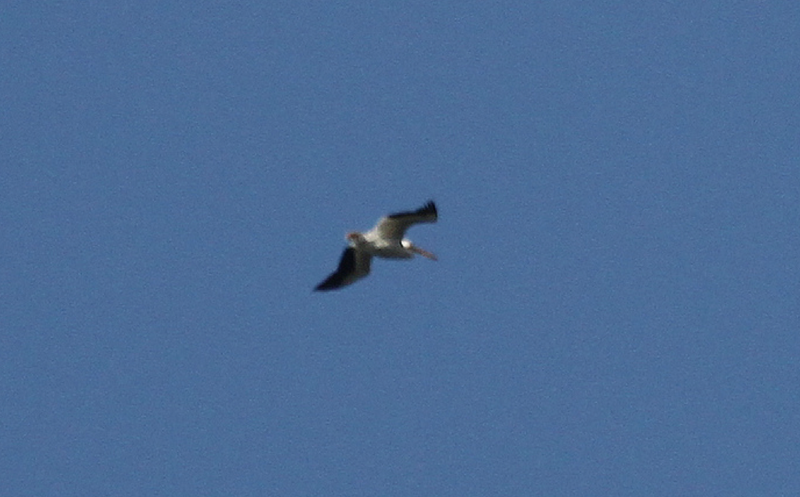 Second record for Barnstable and first photographed. 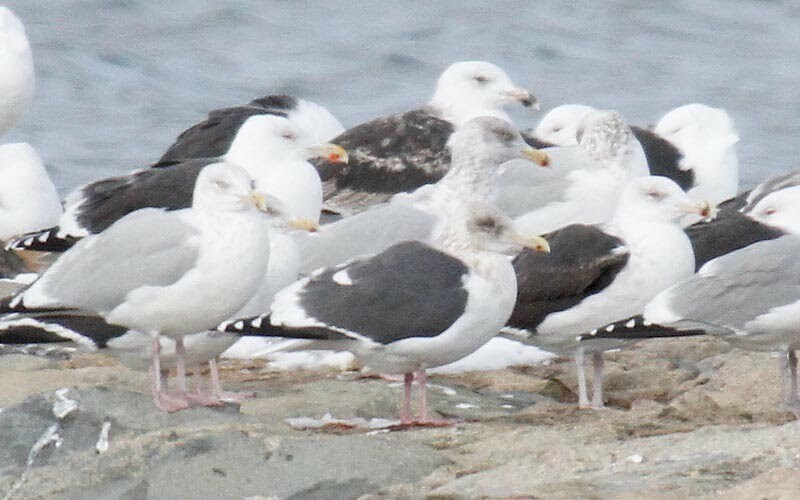 Slaty-backed Gull from Wellfleet Harbor, 22 Jan 2012. Photo by B. Nikula. 2011-96: 1 at Long Point Wildlife Refuge, Martha’s Vineyard, Dukes, 8/31/2011 [† T. Spahr*]; accepted on second round (7-1). 2012-76: 1 at Gooseberry Neck, Westport, Bristol, 8/23/2012 [ph. † M. Iliff*]. White-winged Dove from Westport 23 Aug 2012. Photo by M. Iliff. 2012-133: 1 at Marblehead Neck, Essex, 11/7/2012 [ph. anonymous]. 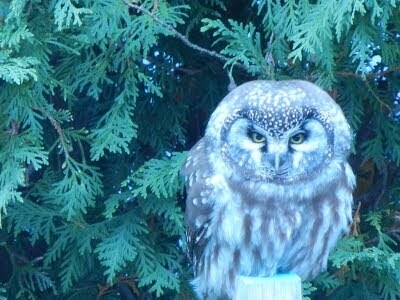 Boreal Owl! 7 Nov 2012, Marblehead Neck. 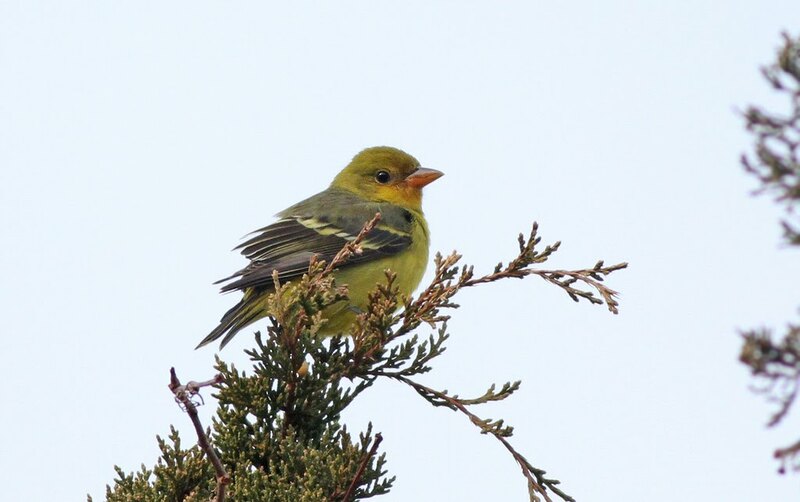 Photos and discovery by an anonymous birder. 2012-138: 1 adult male at Mt. Pleasant Square, Randolph, Norfolk, 7/25/2012 to 7/29/2012 [ph. † L. Buchanan*]. 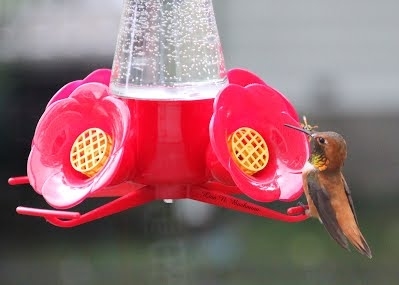 Adult male Rufous Hummingbird, Norfolk Co., 28 Jul 2012. Photo by L. Buchanan. 2012-123: 1 juvenile at Parker River National Wildlife Refuge maintenance buildings (“The Warden’s”), Plum Island, Newbury, Essex, 10/4/2012 to 10/5/2012 [† J. Berry, ph. M. Iliff, ph. E. Labato*, ph. R. Schain]. 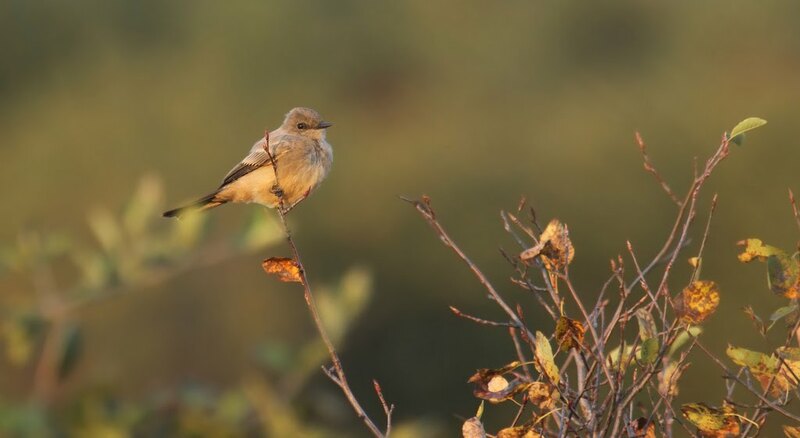 Say’s Phoebe at sunrise at Parker River NWR, 5 Oct 2012. Photo by R. Schain. 2011-77: 1 juvenile at Fort Hill, Eastham, Barnstable, 11/11/2011 to 12/30/2011 [ph. J. Trimble*]. Ash-throated Flycatcher at Fort Hill, Eastham, 11 Nov 2012. Photo by J. Trimble.2012-92: 1 at Colburn St., Gloucester, Essex, 12/16/2012 to 12/22/2012 [ph. † M. Goetchkes, W. Miller*, B. Volke*]. 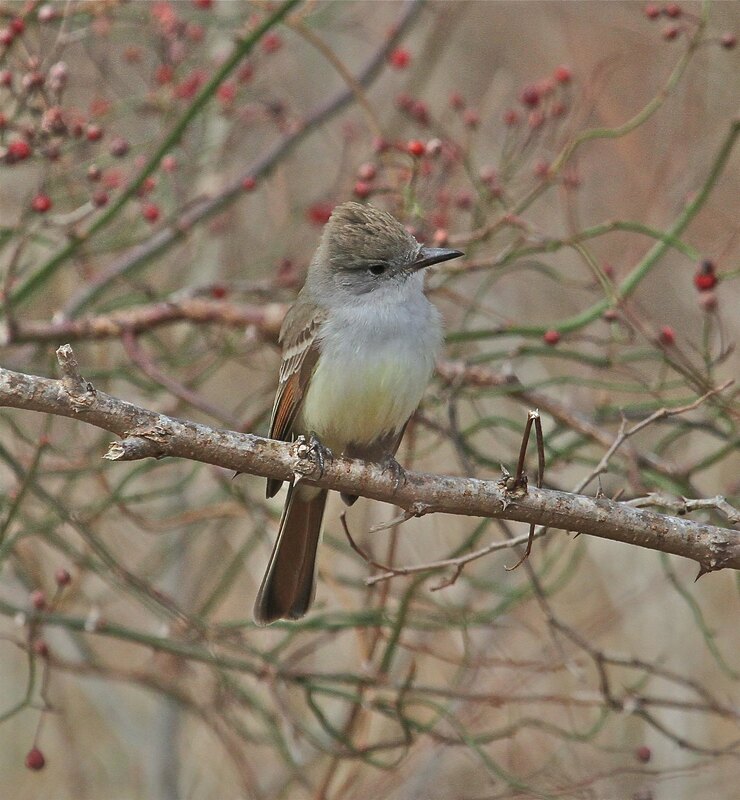 Great portrait of an Ash-throated Flycatcher at Rockport, 22 Dec 2012. Photo by M. Goetchkes. 2012-115: 1 at Gay Head Cliffs, Aquinnah, Martha’s Vineyard, Dukes, 10/23/2012 [ph. L. McDowell*]. First record for Dukes County. 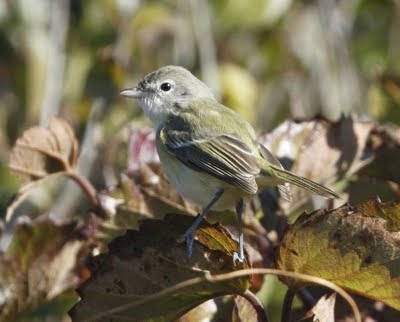 Bell’s Vireo from Aquinnah on 23 Oct 2012. Photo by L. McDowell. 2012-126: 1 at Phillips Andover Academy, Andover, Essex, 9/11/2012 [† Bob Muldoon*]. 2011-69: 1 at Morris Island Causeway, Chatham, Barnstable, 10/25/2011 to 10/28/2011 [D. Manchester*, ph. R. Schain, ph. P. Trimble]. Townsend’s Solitaire, Chatham, 28 Oct 2011. Photo by R. Schain. 2012-122: 1 at South Monomoy Lighthouse Banding Station, Chatham, Barnstable, 10/5/2012 [N. Ernst*, ph. J. Junda*]. 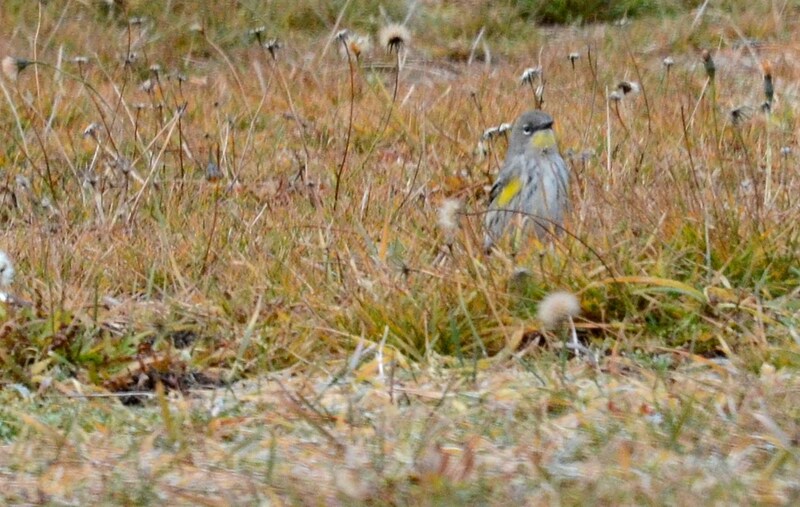 Townsend’s Solitaire and beach grasses too at South Monomoy Lighthouse on 5 Oct 2012. Photo by J. Junda. 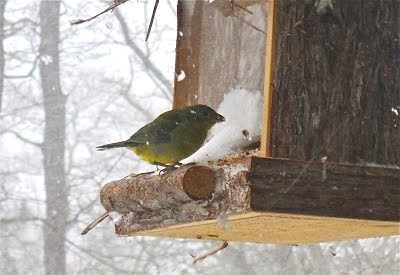 2013-10: 1 at Greenough Conservation Land, Carlisle, Middlesex, 3/17/2013 to 3/23/2013 [A. Ankers*, ph. I. Davies, ph. M. Iliff, ph. J. Lawson, ph. J. Trimble]. Second record for state and for Middlesex County. 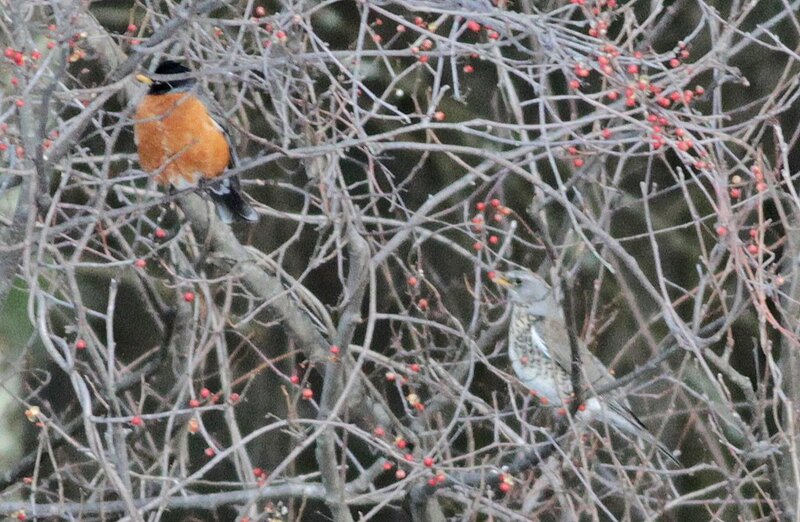 Fieldfare and robin by I. Davies, 17 Mar 2013. Carlisle, MA. 2013-08: 1 at paved road between Herring Cove and Province Lands Visitor Center, Provincetown, Barnstable, 2/18/2013 [ph. J. Taylor*]. 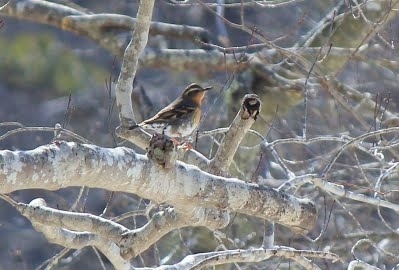 Varied Thrush at Provincetown 18 Feb 2013. Photo by J. Taylor. 2012-104: 1 at Richardi Reservoir, Braintree, Norfolk, 12/16/2012 to 12/22/2012 [G. d’Entremont*, ph. M. Iliff, A. O’Neill*, J. Young]. First December record for Massachusetts. Winter Blue-winged Warbler, 22 Dec 2012, Richardi Reservoir, Norfolk Co. Photo by M. Iliff. 2012-136: 1 at Estabrook Road, Carlisle, Middlesex, 12/26/2012 to 1/22/2013 [ph. † K. Harte*]. Unusually late. Black-and-white Warbler in Carlisle, 9 Jan 2013. Photo by K. Harte. 1883-01: 1 at Readville, Suffolk, 5/24/1883 [D. Blaney*, ph. J. Trimble (MCZ specimen)]. Only physically documented record for spring (cf. Garvey and Iliff 2012). 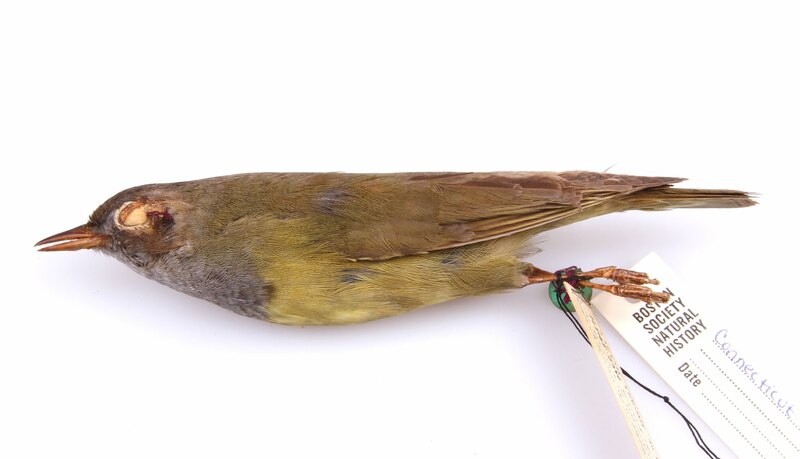 Connecticut Warbler specimen. Readville, 24 May 1883. 2011-70: 1 female at Rocky Point Road, Bourne, Barnstable, 12/17/2011 to 1/8/2012 [† M. Iliff*, ph. J. Trimble]. 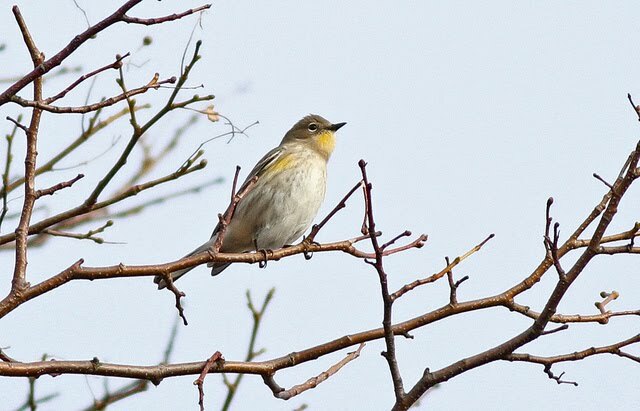 Yellow-rumped Warbler, Audubon’s subspecies, at Bourne, 17 Dec 2011. Photo by M. Iliff.2012-93: 1 at Salisbury Beach Reservation, Salisbury, Essex, 12/7/2012 to 12/15/2012 [ph. T. Factor, ph. J. Offermann, ph. E. Nielsen, ph. † T. Spahr*]. 2012-121: 1 apparent immature male at South Monomoy Lighthouse Banding Station, Chatham, Barnstable, 10/6/2012 [N. Ernst*, ph. J. Junda*]. 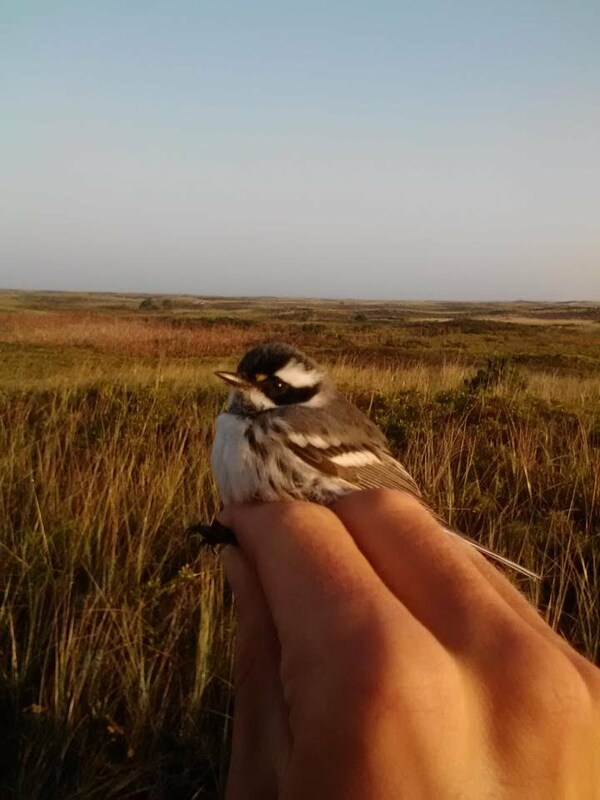 Odd juxtaposition: Black-throated Gray Warbler and beach grasses. Photo by J. Junda, 6 Oct 2012, South Monomoy Lighthouse. 2013-03: 1 apparent immature male at James H. Luther Drive, Taunton, Plymouth, 1/3/2013 to 1/23/2013 [ph. R. Davenport*, ph. † M. Iliff, ph. G. Kessler, ph. J. Trimble]. 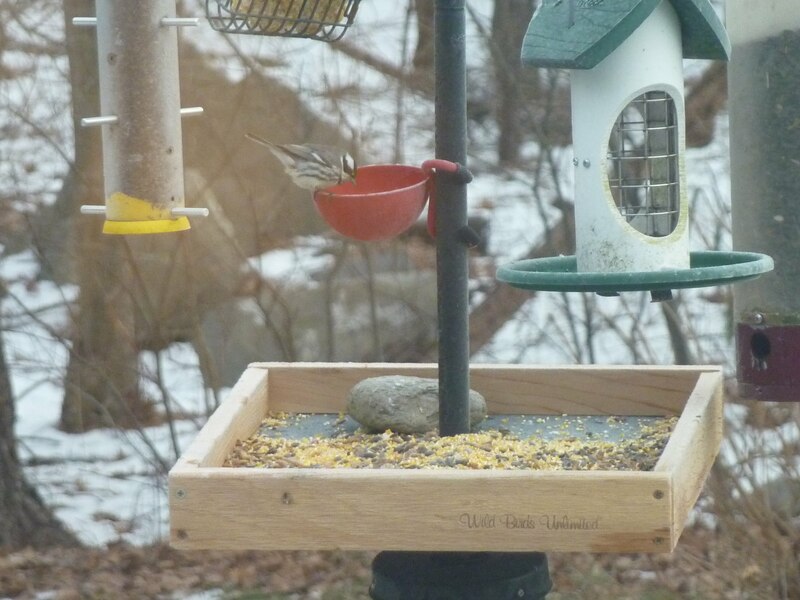 Black-throated Gray Warbler visiting feeder in winter. Photo by R. Davenport, 9 Jan 2013, Taunton. 2011-71: 1 at County Road, Ipswich, Essex, 12/24/2011 to 3/27/2012 [ph. † J. Berry*, ph. N. Berry, ph. P. Brown, ph. J. Offermann, ph. R. Schain, ph. B. Zaremba]. Townsend’s Warbler, 7 Jan 2012, Ipswich. Photo by J. Trimble. 2012-01: 1 at Eden and Lucia Roads, Loblolly Cove, Rockport, Essex, 1/26/2012 to 3/7/2012 [v. M. Garvey, ph. M. Iliff, ph. J. Trimble, † F. Vale*, † P. Vale*]. 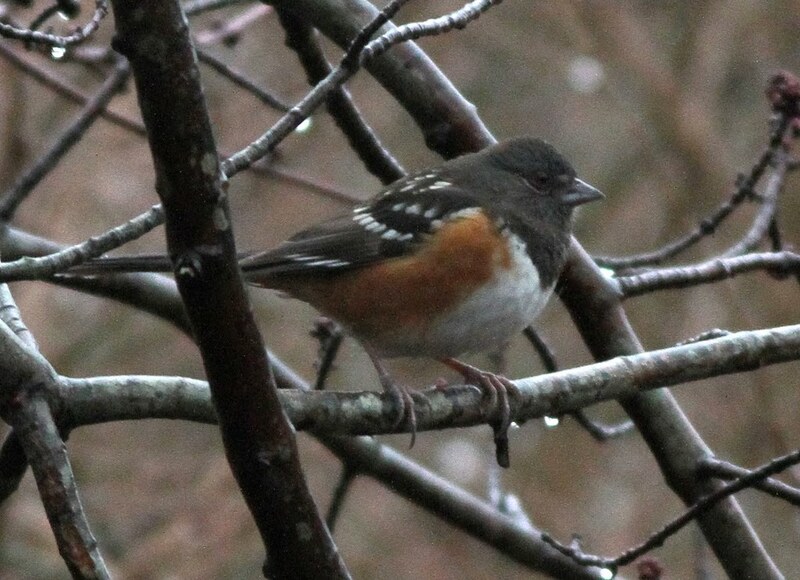 Spotted Towhee, 27 Jan 2012. Rockport, MA. Photo by J. Trimble. 2012-65: 1 at Brewster, Barnstable, 4/20/2012 to 4/21/2012 [ph. J. Trimble]. First accepted record for Massachusetts. Great pose from this Black-throated Sparrow, a phenomenal stray from the west. Photo by J. Trimble, 21 Apr 2012. 2013-06: 1 at Shadyside Road, Concord, Middlesex, 2/12/2013 to 2/15/2013 [v. Bruce deGraaf, † M. Gilmore*, ph. J. Trimble]. 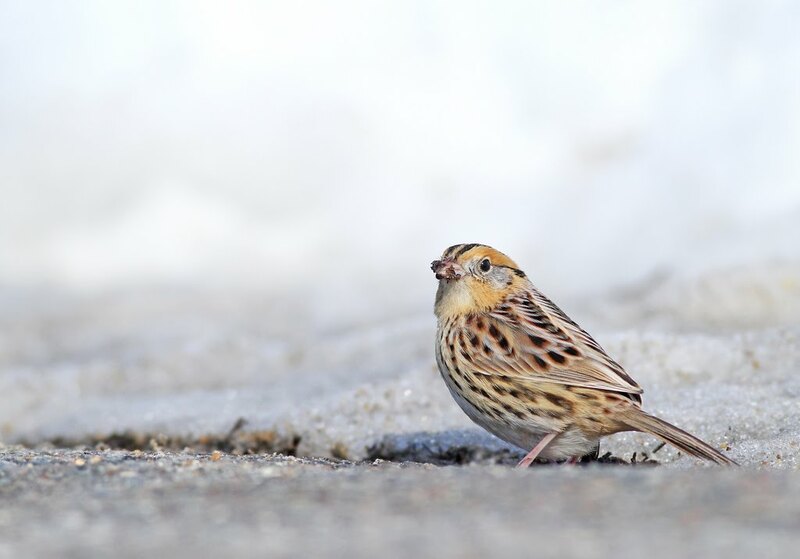 Le Conte’s Sparrow, in the snow. Concord, 12 Feb 2013. Photo by J. Trimble. 2010-84: 1 at Indian Trail Road, Barnstable, Barnstable, 12/28/2010 [† F. Atwood*, † G. Hirth*]; accepted on second round (8-0). First record for Massachusetts of Sooty group. 2012-02: 1 at Bound Island Brook Road, Wellfleet, Barnstable, 1/15/2012 to 2/5/2012 [ph. M. Iliff, ph. R. Schain, ph. J. Trimble, ph. P. Trimble, † J. Young*]; accepted on second round (8-0). Second record for Massachusetts of Sooty group. ‘Sooty’ Fox Sparrow, Wellfleet, 5 Feb 2012. Photo by R. Schain. 2013-07: 1 at Periwinkle Lane, Ipswich, Essex, 1/2/2012 to 1/4/2012 [† ph. B. Flemer*]. 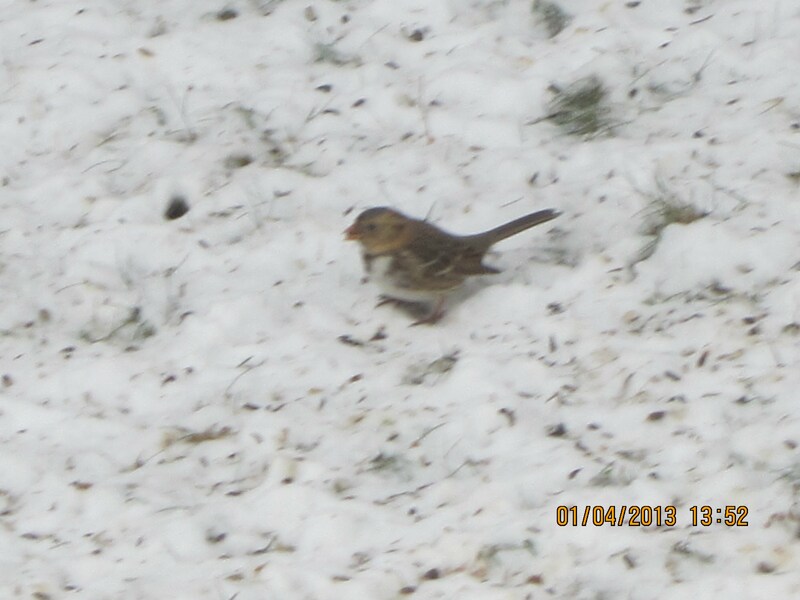 Harris’s Sparrow from Ipswich, 4 Jan 2013. Photo by B. Flemer. 2012-03: 1 hatch-year male at Emer and Littlefield Lanes, Marlboro, Middlesex, 1/3/2012 to 1/11/2012 [D. Ely*, ph. M. Iliff, ph. R. Schain, ph. T. Spahr*]. 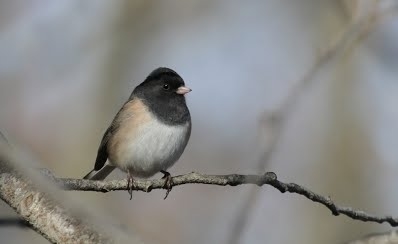 ‘Oregon’ Dark-eyed Junco. 5 Jan 2012, Marlborough. Photo by R. Schain. 2011-72: 1 at Nonquit Road, Falmouth, Barnstable, 12/17/2011 to 12/30/2011 [C. Dalton*, ph. R. Schain, ph. J. Trimble]. 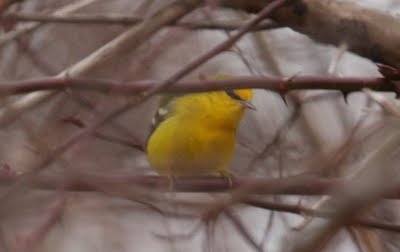 Western Tanager, 23 Dec 2011, Falmouth. Photo by J. Trimble. 2012-77: 1 immature male at Wellfleet Bay Wildlife Sanctuary, Wellfleet, Barnstable, 2/4/2012 to 3/2/2012 [ph. M. Faherty*, ph. R. Schain]. Young male Lazuli Bunting. Wellfleet Bay WS, 5 Feb 2012. Photo by R. Schain. 2012-129: 1 female at Administration Building, Thompson Island, Suffolk, 12/16/2012 [v. M. Garvey*, ph. M. Iliff, † ph. N. Yusuff*]. First record for Suffolk County. 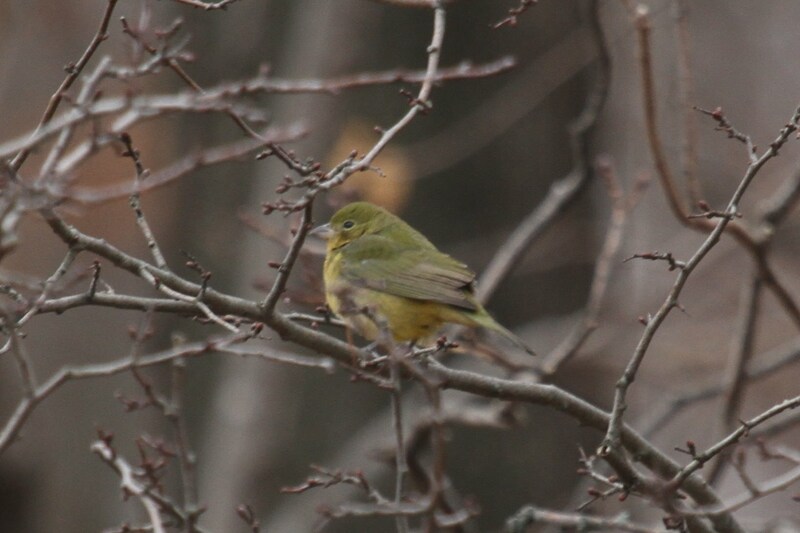 Female Painted Bunting at Thompson Island, 16 Dec 2012. Found as part of Greater Boston CBC. Photo by N. Yusuff.2012-141: 1 at Eldridge Parkway, Orleans, Barnstable, Feb. 2012 [ph. A. Farrell*]. Female Painted Bunting. Orleans, Feb 2012. Photo by A. Farrell. 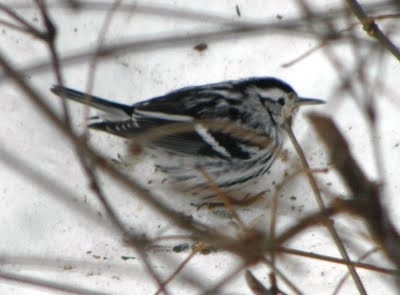 2012-90: 1 female at Marblehead, Essex, 12/12/2012 to 12/28/2012 [† Jim Berry, ph. B. Graves*, ph. R. Heil]. 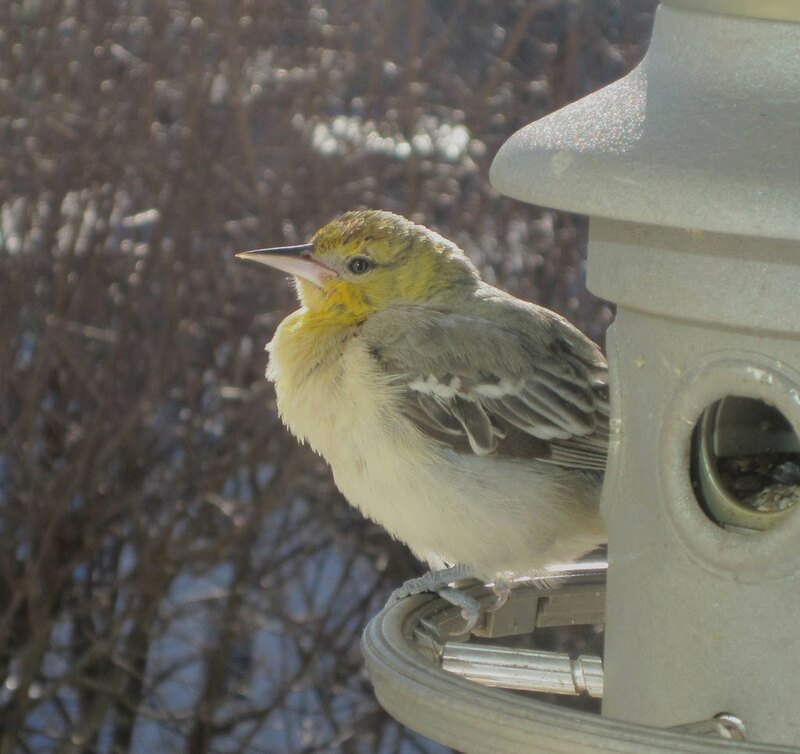 Bullock’s Oriole visiting a feeder in Marblehead. 28 Dec 2012. Photo by R. Heil. 2013-09— “Greater” Common Redpoll (rostrata)—1 at Andrew’s Point, Rockport, Essex, 2/5/2013 [ph. † Tim Spahr]; accepted on second round (7-1). 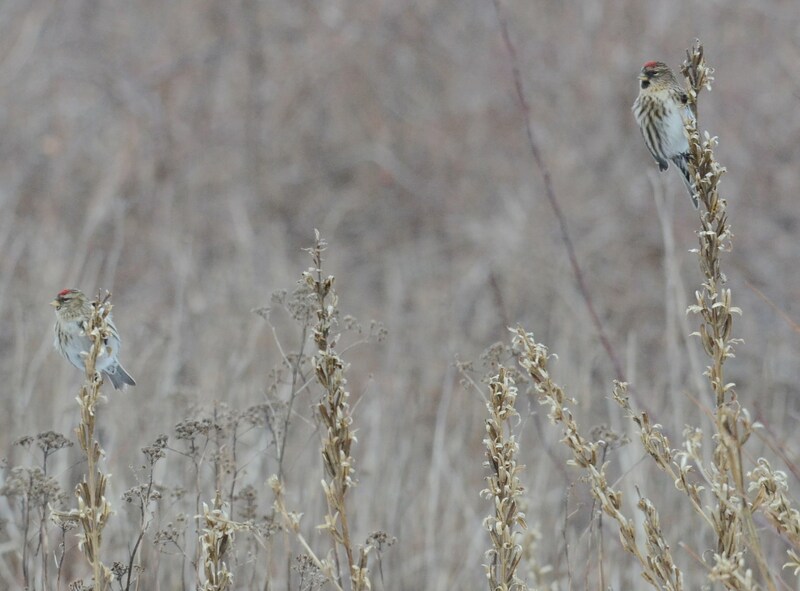 Common Redpoll (left), and Common Redpoll, rostrata subspecies (right). 5 Feb 2013, photo by T. Spahr. 2013-05: 1 at The Campus, Marlboro, Middlesex, 1/8/2013 [ph. † Tim Spahr*]; accepted on second round (7-1). 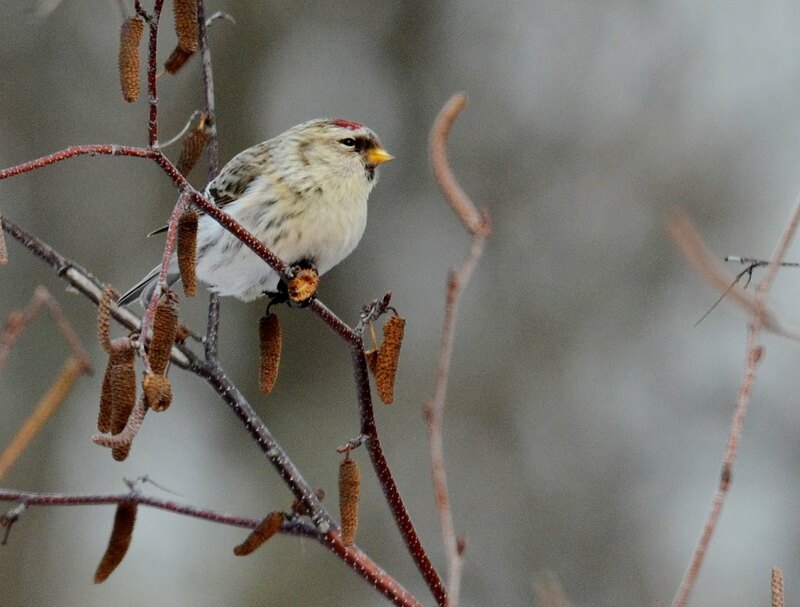 Hoary Redpoll and birch catkins, 8 Jan 2013, Marlboro. Photo by T. Spahr. 2012-134: 1 at MacMillan Wharf, Provincetown, Barnstable, 12/8/2012. Rejected on third round (0-8). 2011-068: 1 at Harding’s Beach, Chatham, Barnstable, 3/26/2011. Rejected on third round (3-5). 2012-80: 1 at Oceanographer Canyon, 8/26/2012. Rejected on third round (1-7). 1944-01: 1 at Carr’s Island, Merrimack River, Essex, 1/15/1944 to 1/30/1944. Rejected on first round (0-8). 2011-98: 1 at Niles Pond, E. Gloucester, Essex, 12/3/2011. Rejected on a third round (0-8). 2013-01: 1 at Westboro WMA, Westboro, Worcester, 1/2/2013. Rejected on third round (3-5). 2013-02: 1 at Westboro WMA, Westboro, Worcester, 1/4/2013. Rejected on third round (2-6). 1998-32: 1 at South Elm Street Fields, West Bridgewater, Plymouth, 4/4/1998. Identification accepted; rejected on provenance issues on third round (6-2). 1908-01: 1 male at Boston Public Garden, Boston, Suffolk, 10/4/1908 to at least 3/25/1909 (See Wright 1909). Identification accepted; rejected on provenance issues on first round (0-8). American Ornithologists’ Union. 1998. Check-List of North American Birds, 7th ed. Lawrence, Kansas: American Ornithologists’ Union. Chesser, R. T., R. C. Banks, F. K. Barker, C. Cicero, J. L. Dunn, A. W. Kratter, I. J. Lovette, P. C. Rasmussen, J. V. Remsen Jr., J. D. Rising, D. F. Stotz, and K. Winker. 2009. Fiftieth Supplement to the American Ornithologists’ Union Check-List of North American Birds. Auk 126(3): 705–714. Chesser, R. T., R. C. Banks, F. K. Barker, C. Cicero, J. L. Dunn, A. W. Kratter, I. J. Lovette, P. C. Rasmussen, J. V. Remsen Jr., J. D. Rising, D. F. Stotz, K. Winker. 2010. Fifty-first Supplement to the American Ornithologists’ Union Check-List of North American Birds. Auk 127(3): 726-744. Chesser, R. T., R. C. Banks, F. K. Barker, C. Cicero, J. L. Dunn, A. W. Kratter, I. J. Lovette, P. C. Rasmussen, J. V. Remsen Jr., J. D. Rising, D. F. Stotz, K. Winker. 2011. Fifty-second supplement to the American Ornithologists’ Union Check-List of North American Birds. Auk 128(3): 600-613. Chesser, R. T., R. C. Banks, F. K. Barker, C. Cicero, J. L. Dunn, A. W. Kratter, I. J. Lovette, P. C. Rasmussen, J. V. Remsen Jr., J. D. Rising, D. F. Stotz, K. Winker. 2012. Fifty-third supplement to the American Ornithologists’ Union Check-List of North American Birds. Auk 129(3): 573-588. Chesser, R. T., R. C. Banks, F. K. Barker, C. Cicero, J. L. Dunn, A. W. Kratter, I. J. Lovette, P. C. Rasmussen, J. V. Remsen Jr., J. D. Rising, D. F. Stotz, K. Winker. 2013. Fifty-fourth supplement to the American Ornithologists’ Union Check-List of North American Birds. Auk 130(3): 558-571. Clements, J.F. 2011. Clements Checklist of Birds of the World 6.8. Available online at http://www.birds.cornell.edu/clementschecklist. Garvey, M. and M. Iliff. 2011. Fifteenth Report of the Massachusetts Avian Records Committee. Bird Observer 39(3): 133-153. Garvey, M. and M. Iliff. 2012. Sixteenth Report of the Massachusetts Avian Records Committee. Available online at http://www.maavianrecords.com/home/annual-reports/report-16. Griscom, L. and D. Snyder. 1955. Birds of Massachusetts: An Annotated and Revised Checklist. Peabody Museum. Rines, M. 2009. Thirteenth Report of the Massachusetts Avian Records Committee. Bird Observer 37(2): 85-97.Available online at http://www.maavianrecords.com/home/annual-reports/report-13. Petersen, W. R. 1994. First Report of the Massachusetts Avian Records Committee. Bird Observer 25(3):263-274. Available online at http://www.maavianrecords.com/home/annual-reports/report-1. Veit, R. R. and W. R. Petersen. 1993. Birds of Massachusetts. Lincoln, Massachusetts: Massachusetts Audubon Society. Wright, H. 1909. 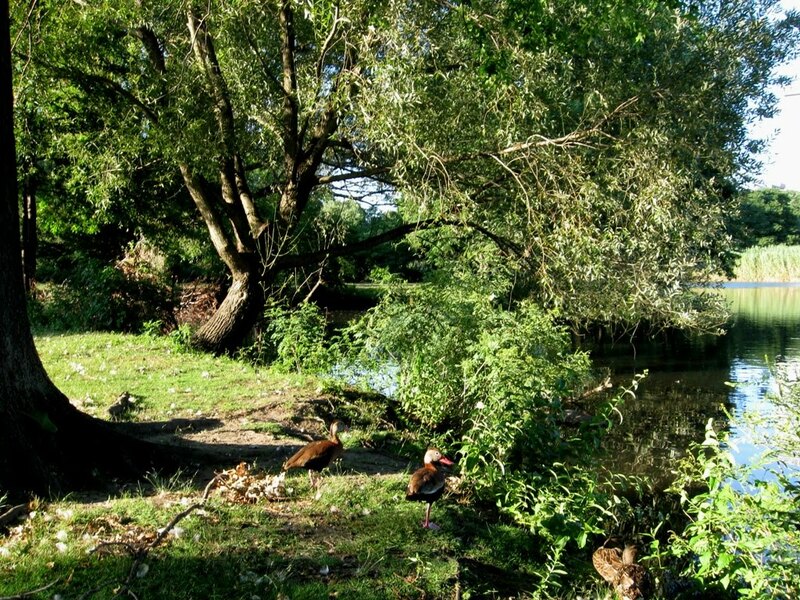 Birds of the Boston Public Garden: A Study in Migration. Boston: Houghton Mifflin Co.